With the volume and complexity of advanced attacks only increasing, genuine threats are buried in the noise of busy networks. In an attempt to protect themselves, organisations have added more single point tools into their security stacks but this has only further complicated the detection and management of malicious activity. With a growing skills gap, overburdened security professionals are faced with new challenges that existing tools struggle to alleviate. The influx of false positive alerts generated distracts security teams away from investigating genuine threats. 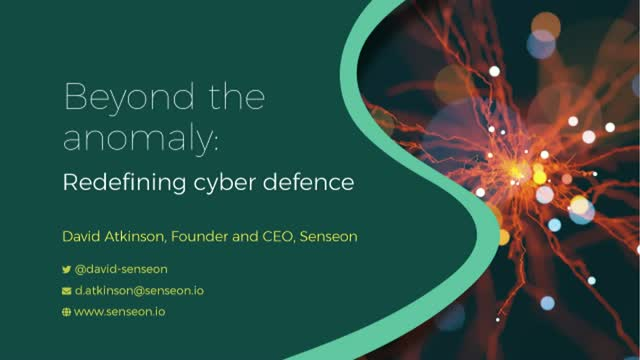 David will demonstrate how Senseon’s unique technology - ‘AI Triangulation’ - that blends the detection of threats from multiple perspectives across an organisations entire digital estate (endpoint devices, the network and Investigator Bots) is transforming cyber defence, helping security teams to focus their efforts on genuine and malicious activity.